Houseplants seem to get more attention during the doldrums of winter than any other time. Not much else is growing green now, or dare I say, flowering? 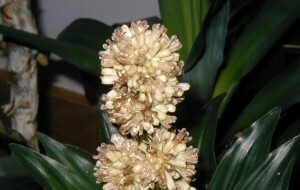 We had a surprise blooming from a houseplant that had spent its summer and part of autumn on a balcony outdoors. Once inside it was protected from the harsh weather, but it didn’t get regular watering or perhaps not enough water at some point. Some leaves have brown tips, but others are dark green and glossy. It’s in a room that’s cooler than the rest of the house. Maybe it sensed it wasn’t in the best of conditions and tried to reproduce. I think it’s a type of Dracaena with short, wide leaves that are lance-shaped and pointed at the end. The base of the leaves overlap as they sheath the main stem. When the leaves eventually fall away, they leave behind a diamond-like pattern on the stem that is characteristic of Dracaena. 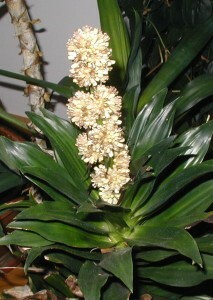 Dracaena flower stalk and foliage. Photo taken 11Jan2011. 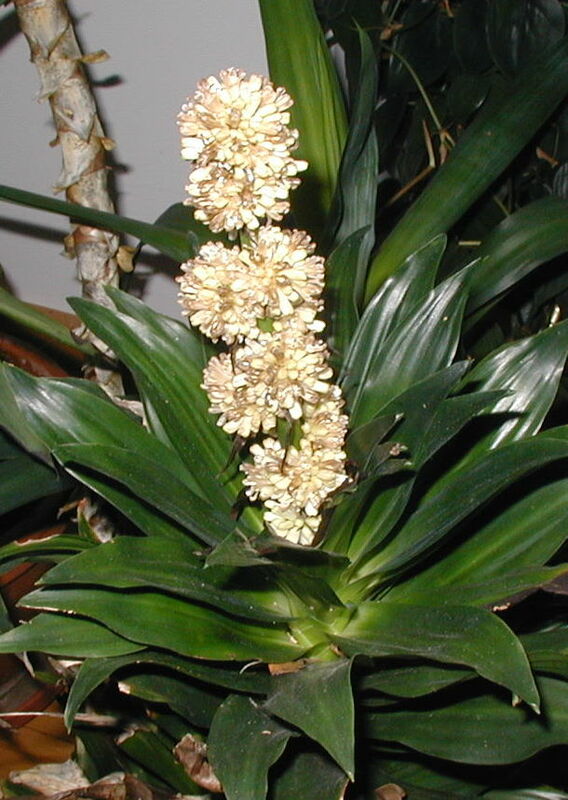 Dracaena with many new white flowers in bunches along its flower stalk. Photo taken 26Dec2011. A couple weeks later the flowers were still taking their turns blooming. Individual flowers are clustered into round groups. 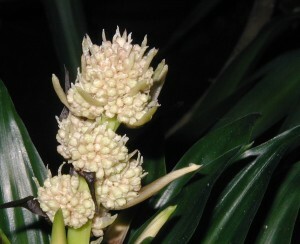 Flowerstalk of dracaena. Photo taken 11Jan2011. 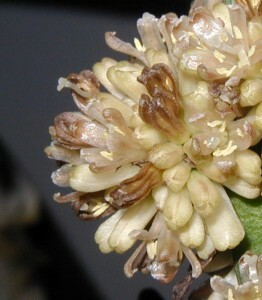 In the close-up below you can see the individual flowers that have already bloomed are turning brown. Flowers still blooming are creamy white. Closeup look at individual flowers. Photo taken 11Jan2011. 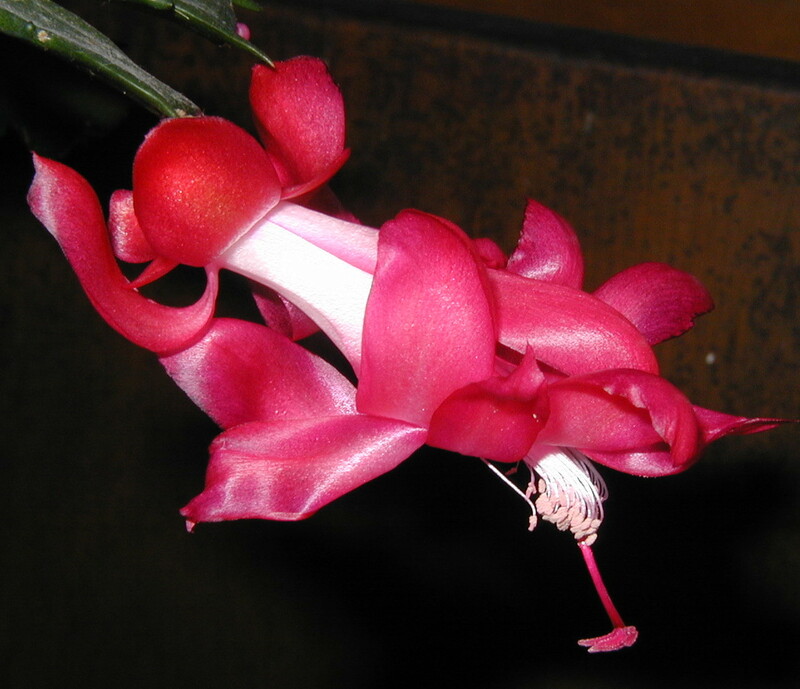 Flowering plants that we see this time of year are only house plants that have been protected from the harsh and freezing cold weather of winter. A few Christmas cacti bloomed when kept out in the mudroom, but dropped their blooms when brought into the house. The mudroom is like a closed-in porch that gets no direct heat. It doesn’t freeze out there because the room is attached to the house, yet there are no heating ducts to keep it warm. This area is on the south side of the house, so when it’s sunny the room gets much warmer than on cloudy days due to the full-length window or slider door that faces south. Nights are definitely cool, though! The cacti seem to love it. Christmas cactus blooming. Photo taken 26Dec2010. 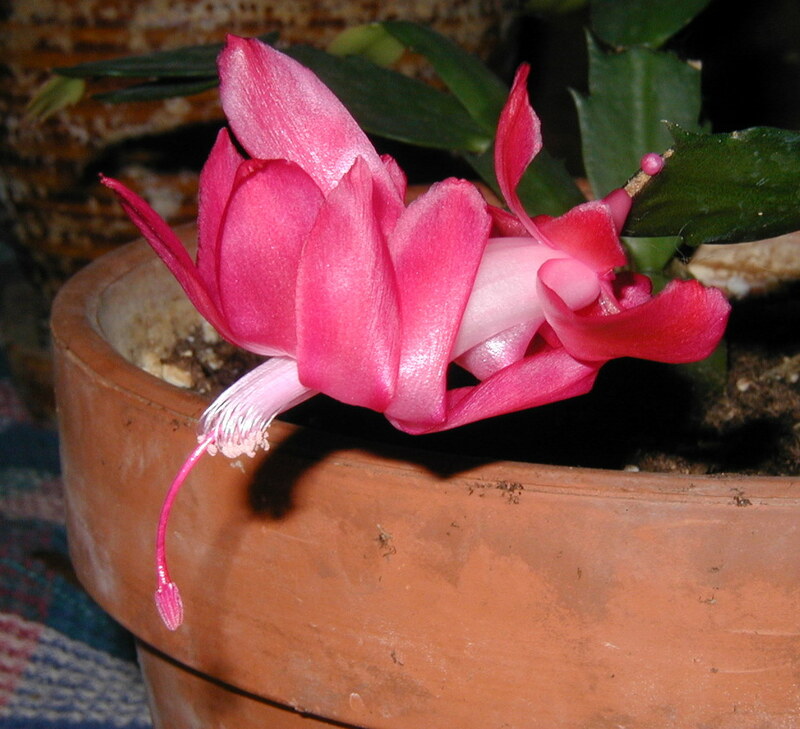 Christmas cactus in bloom. Photo taken 26Dec2010. I’m not sure if it was the warmth of the house in itself that caused the other Christmas cacti to drop their blooms, or if it was the change from a cool location to a warmer one. Probably the latter, but at any rate I’m glad the ones left in the mudroom liked it there.